It was only when I was arranging these mozzarella salads, with pickled peppers from our summer garden, for our first course at lunchtime today that I realised it looked a bit like a flower, which is appropriate since we have a botany blog in the family. For the main course of our new year’s day lunch we had griddled duck breast with roast vegetables and a very good bottle of Emoción red wine from Domaine Monplezy (with its reminder of summer in the hoopoe on the label). The wine went very well with some sheep’s cheese from the Larzac too. 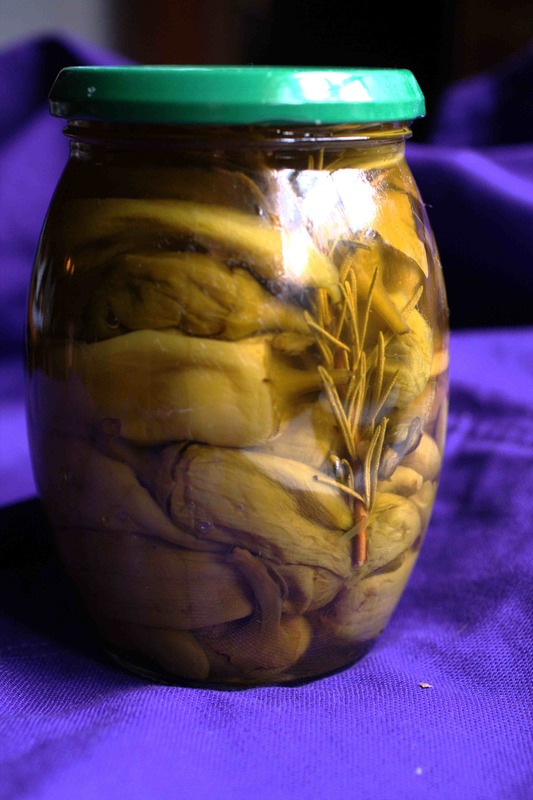 And then we had preserved kumqats (grown by a friend, bottled by me) with a glass of muscat wine. The black olives that I picked a week or so ago – see here – have been soaking in spring water since then and I’ve been changing the water every few days. Today it was time to salt them. Every time I cure olives I think I follow a slightly (or very) different method and this way is possible only because we have a very small crop – just over a kilo this year. I drained the olives and cut a slit in each of them with a sharp knife. Then I added a lot of coarse-grained sea salt – about 500 grams to the kilo of olives and mixed it in so that all the olives were coated with salt. I added a layer of salt over them all and then covered the bowl with a large plate. I’ll leave them like this for a couple of weeks, draining off any liquid from time to time, until I taste an olive and find that it’s no longer bitter. Then they’ll be ready to cover with olive oil and store in jars until we eat them. 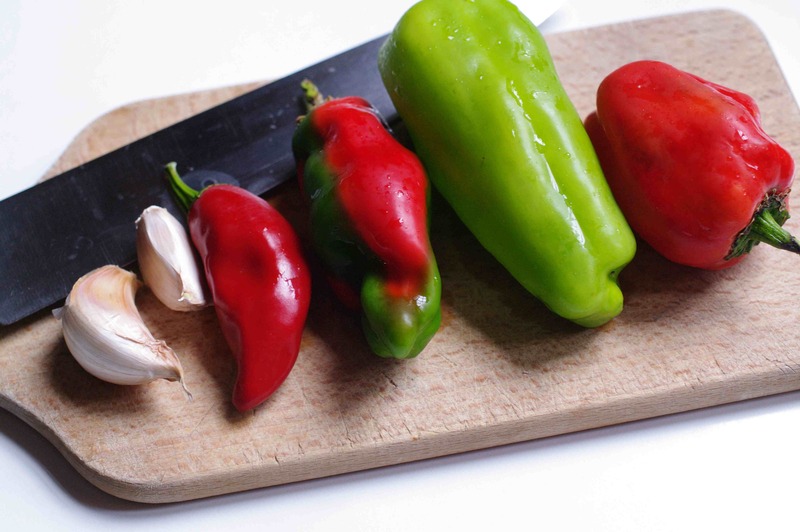 I chopped some of the last of our red and green peppers finely with two cloves of garlic and a piment d’Espelette and some basil leaves. I whizzed two small peeled tomatoes in the liquidiser with some olive oil, a pinch of salt and a dash of balsamic vinegar and mixed this dressing into the chopped vegetables. 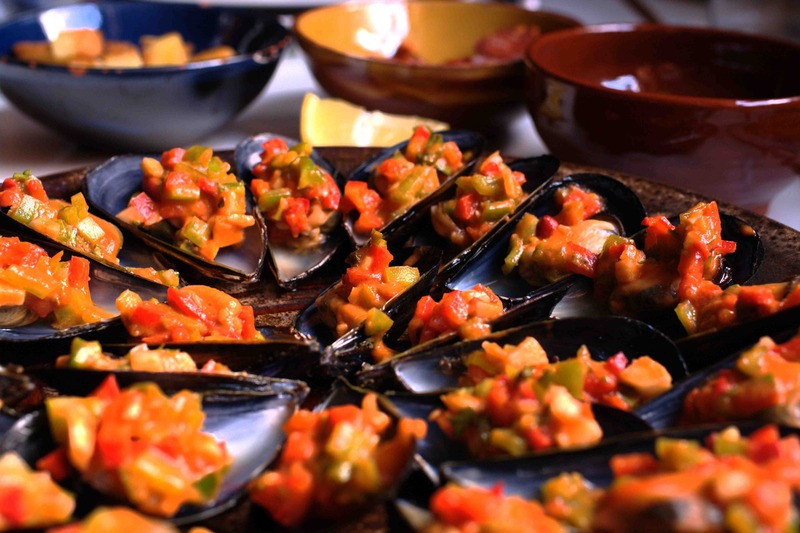 Meanwhile, Lo Jardinièr was cooking the mussels with a glass of white wine until they all opened and removing the empty half of the shell. 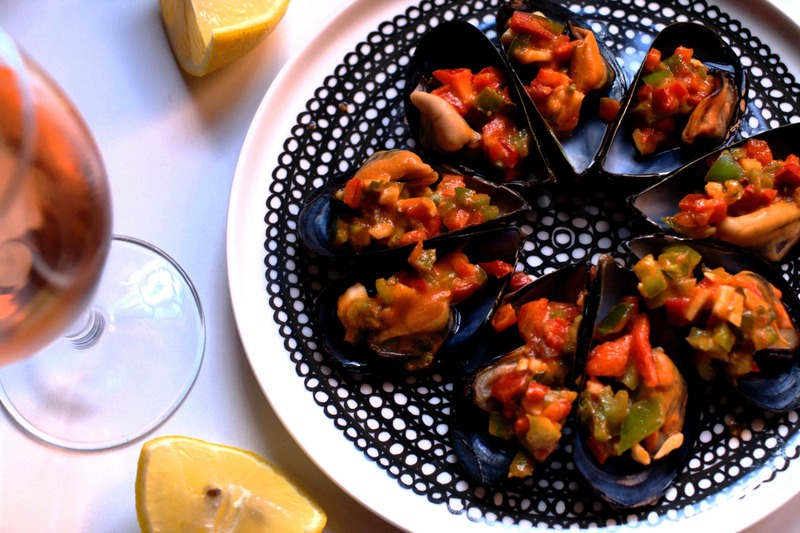 I put a spoonful of the pepper mixture into each mussel shell and we ate them with a squeeze of lemon, bread and a glass of local rosé. This morning almost felt wintry, so cold in the garden that it seemed unlikely that any more peppers would ripen, the plants drooping and slightly frosted looking. I picked all the green and half-red ones I could find, brought them home, saved the bigger ones to cook over the next few days and pickled the rest using a recipe that worked well last year: I mixed half quantities of white wine vinegar and water – how much depends on how many peppers you have but I made about 500 ml in all, adding two cups of sugar, a couple of bay leaves and some sprigs of rosemary. Once the liquid was boiling I added the peppers and let them simmer for about 10 minutes then packed them into sterilised jars. I wedged the bay leaves and rosemary sprigs on top to stop the peppers rising to the surface when I added the cooking liquid to the jars. The peppers will keep for months like this and, drained with a little olive oil added to them, make a good addition to tapas during the winter. 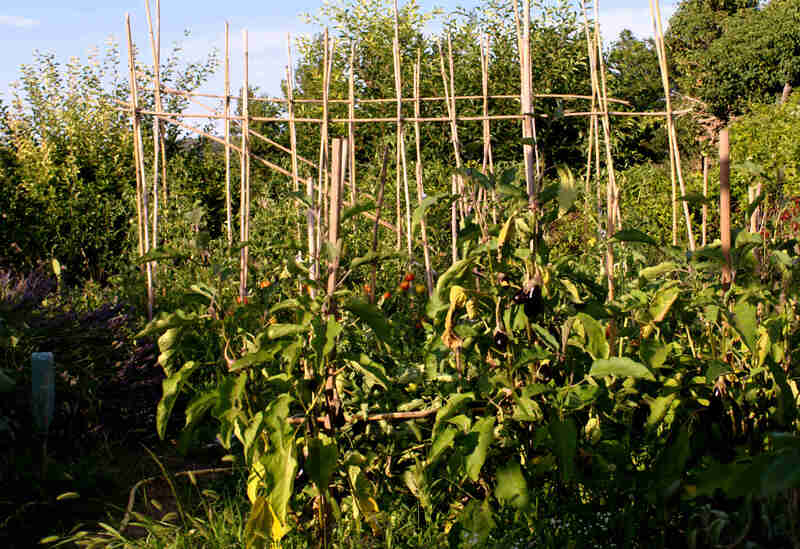 I sowed broad beans this morning for a spring crop – it’s always good to have started the next year in the garden. Within the next couple of weeks, around the beginning of November, production of these delicious goats’ cheeses at Mas Rolland will stop for the winter – we’ll miss them, and we may freeze some for the occasional treat over the next few months. 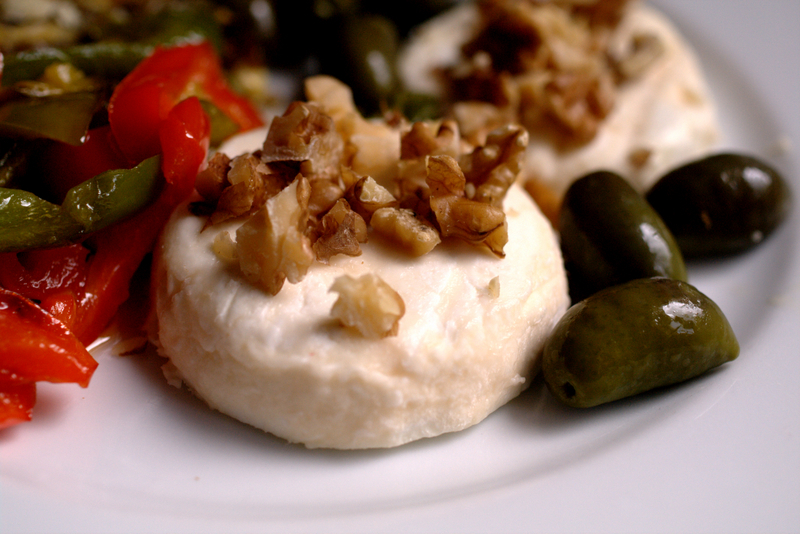 For now, we’re still enjoying eating them with the last of the summer cops – stir-fried red and green peppers that we’re still picking from the garden – and the autumn crop of local Lucques olives, grown by a friend and sold, like the goats’ cheeses, in the village shop. Last year we lost nearly all of our olive crop from both our trees to olive fly attack. 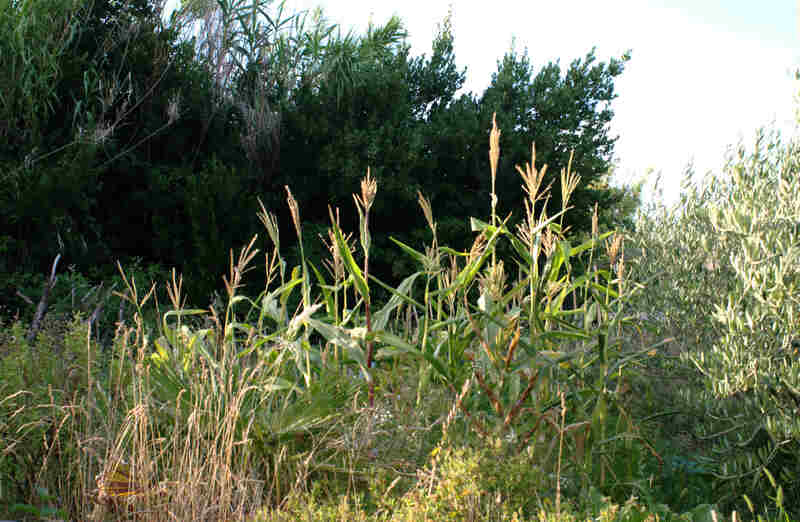 This year I contemplated treating the trees for the first time with toxic chemicals which are apparently necessary to prevent these attacks, but I decided against it because our trees are just too near our vegetables and I wouldn’t want our other crops to be contaminated. So we thought we would risk it. 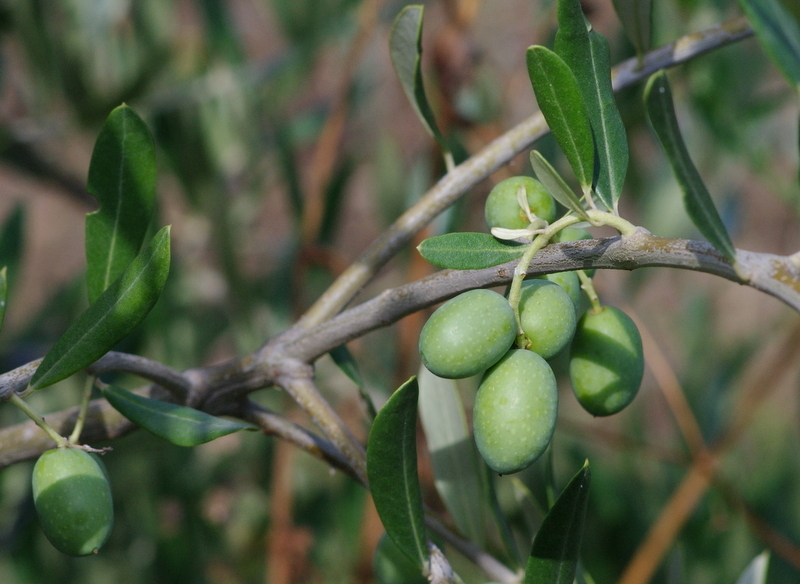 The crop is very small this year, especially on our Lucque tree, because of a strange occurrence of small fruits dropping shortly after setting in the spring, something which has happened to other people’s olives in this area too. Because of this, today I picked a total of 26 olives from our Lucque tree. Such a small crop, but at least they are all undamaged. This is the first time I’ve picked them when they’re still green – in previous years they’ve been left on the tree to ripen – but this variety seem to go a bit mushy when they are cured as black olives. 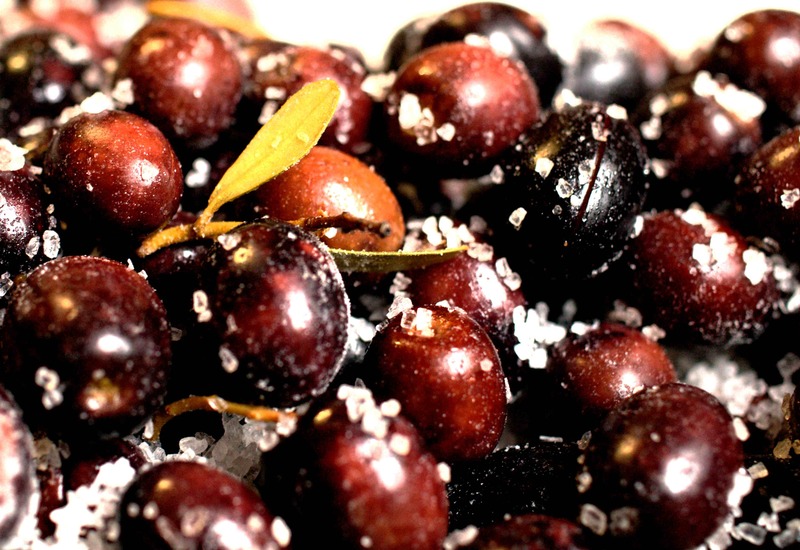 They are used for oil when they’re black, but for table olives I think it’s better to pick them when they’re green. I’ve packed these into a jar with a lot of sea salt to draw out the bitterness. 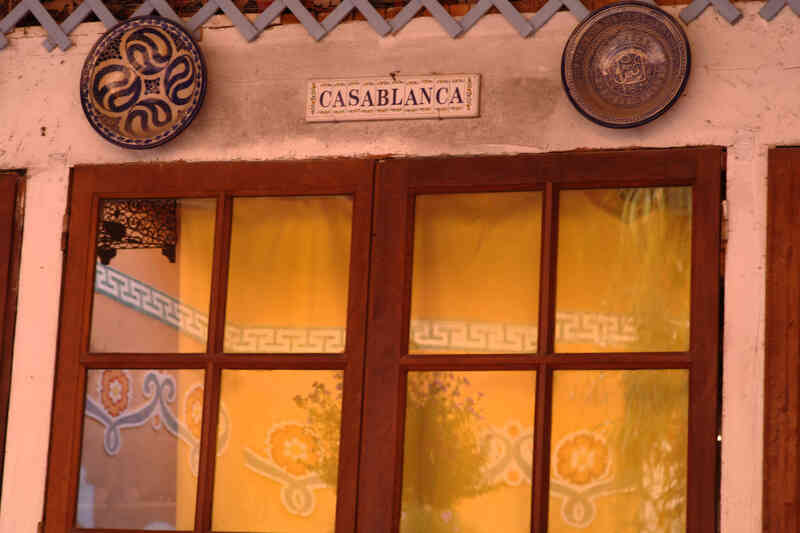 The Lucque variety originated in Lucca in Italy but has become one of the most popular varieties in this area of the Languedoc. 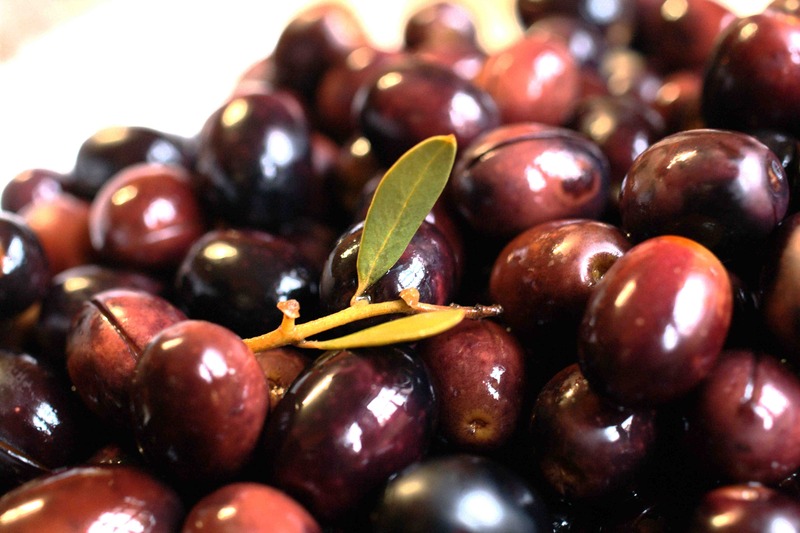 Unlike other olives they have almost crunchy flesh, a delicate crisp flavour and a distinctive pointed shape to the fruits. 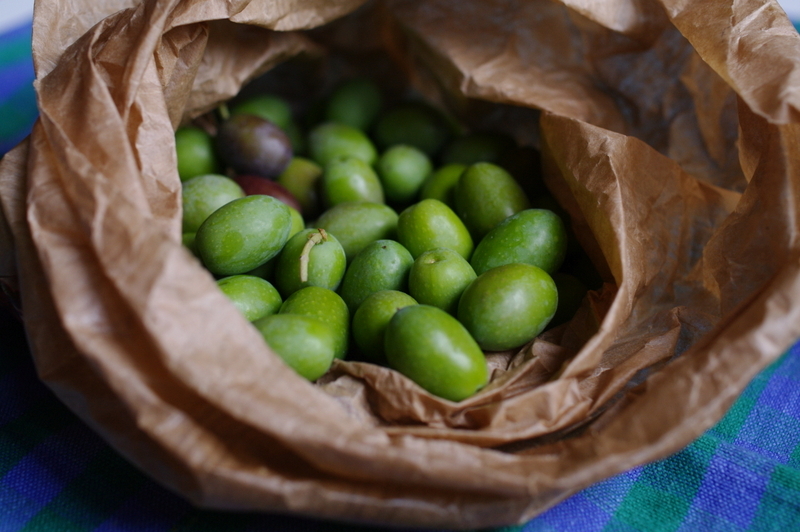 Our other tree, of unknown (or forgotten) variety, has a lot more olives on it, and I picked a few of these today. The rest can stay on the tree to ripen, even at risk of being attacked by the olive fly, although I think the time for that has now passed. 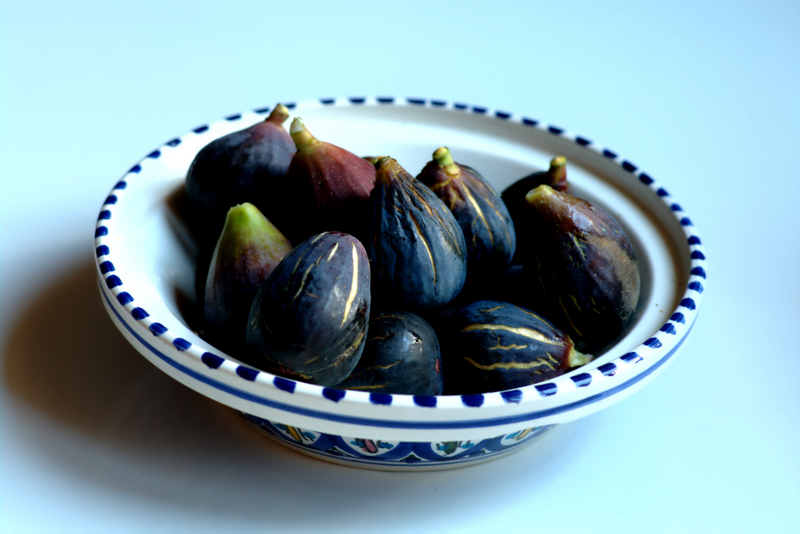 We’ve been picking more figs, too, and making another eight jars of jam. We’ve also been lucky enough to be given a copy of Yotam Ottolenghi and Sami Tamimi’s delicious new book, Jerusalem, and for lunch today Lo Jardinièr made some stuffed vegetables inspired by their recipes. 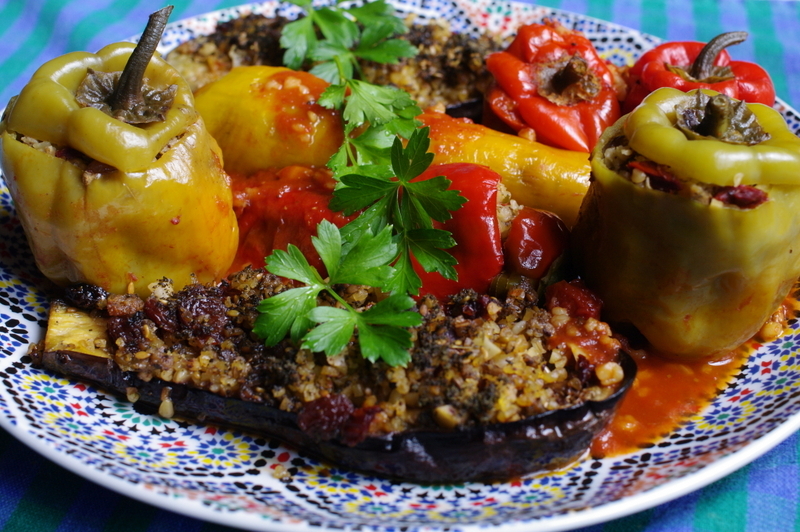 The peppers and aubergines, picked from the garden this morning, were stuffed with a mixture of minced veal, bulghur, chopped almonds and sun dried tomatoes. 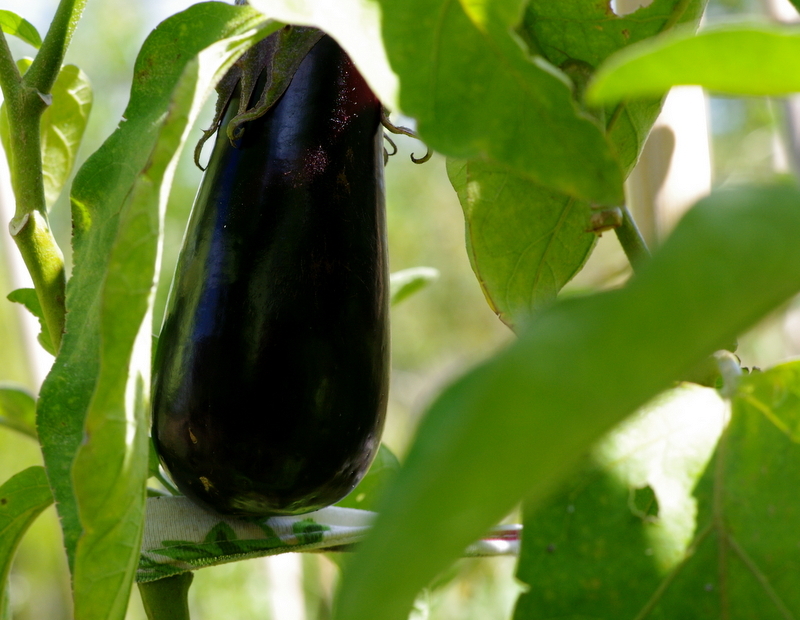 The aubergines were baked in the oven while the peppers were cooked in tomato sauce. They were as tasty as they were colourful. We’re off on a short holiday in a couple of days’ time but when we get back I’m looking forward to cooking some of the recipes from this book. I spent some time this evening threading today’s gathering of Espelette peppers onto strings so they could be hung up to dry. 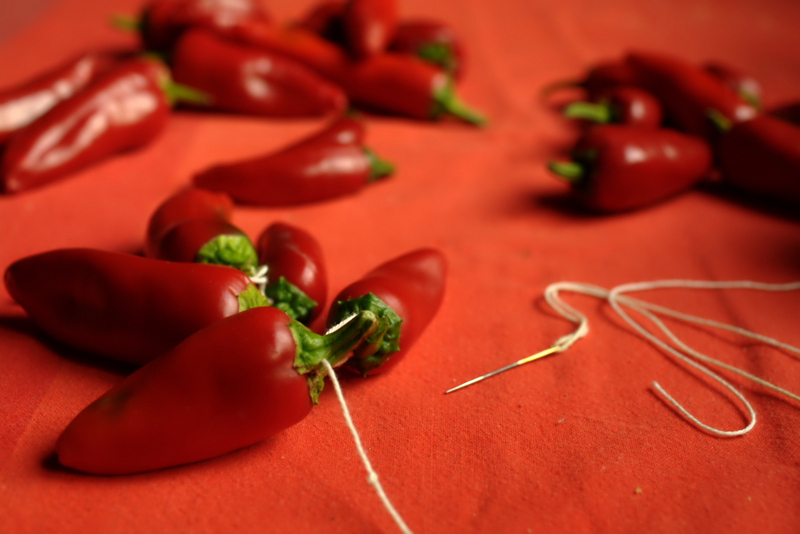 I’ve developed a method which seems to work – I thread some thin crochet cotton onto a bodkin, tie a loop with a knot into the other end and thread the peppers on by passing the needle through the thick ends of the stalks. I tie a simple knot between each pepper to keep them apart as they dry. When there are eight or nine on a string I make a loop in the free end of the thread and hang the strings around the kitchen. Because we have a very dry climate here they dry well and in a few months’ time will be ready to grind in an old coffee grinder (after removing the seeds to save for next year’s crop). Eight of them make enough paprika to fill a small jar. 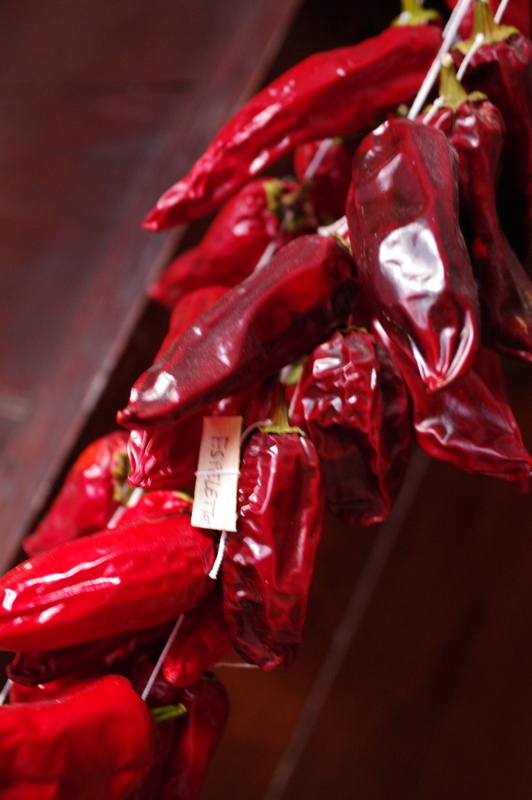 The summer’s crop keeps us in paprika through the winter – we’re still finishing last year’s. 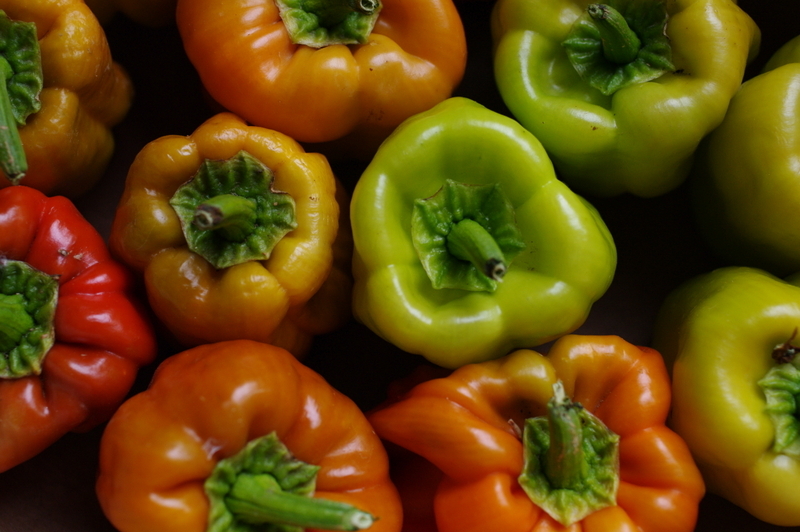 Of all the varieties of pepper we grow these seem the least susceptible to being eaten by bugs and snails – maybe they don’t like the peppery taste! Some I did earlier: the darker ones are last year’s dried peppers, the brighter red ones are from earlier this summer and are partly dry now. As you can see I labelled them ‘Espelette’ although really they shouldn’t be called that as they weren’t grown in the village of that name in the French Basque country which has an appellation d’origine controlée for its peppers. I bought a string of them in the village a few years ago and since then have saved seeds each year from the ones we’ve grown. 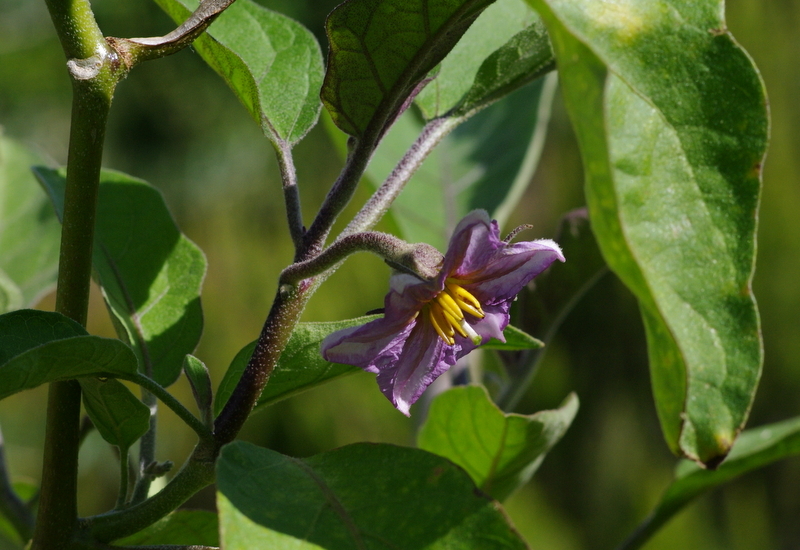 I think this variety makes the best paprika – spicy but not too hot. 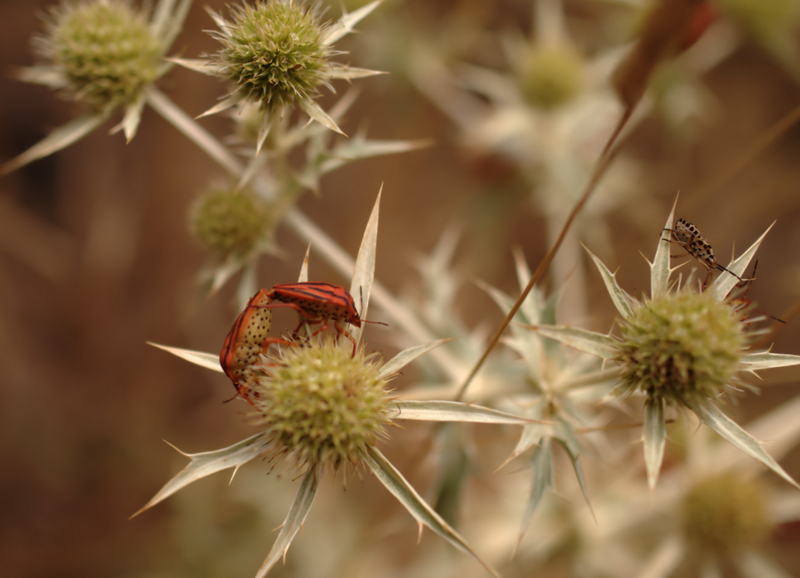 Still summer, or nearly autumn? After a violent thunderstorm the night before last the hot, muggy weather that everyone was complaining about has been replaced by cooler nights, fresher air and a strong wind….that we’re now complaining about! In the garden the tomato plants are nearly over and the remaining fruit are being attacked by bugs of all colours and strips….and spots as well. We’ll pull them up and burn them soon – we have plenty of preserved tomato purée to keep us in sauces until next summer. The peppers plants continue to thrive and are laden with ripening fruit, so that almost every meal we eat contains some delicious variation on a pepper theme – today’s lunch was a stir fry of chicken pieces, peppers and red onions – and some of the red peppers are in the freezer waiting to brighten up a cold winter day. 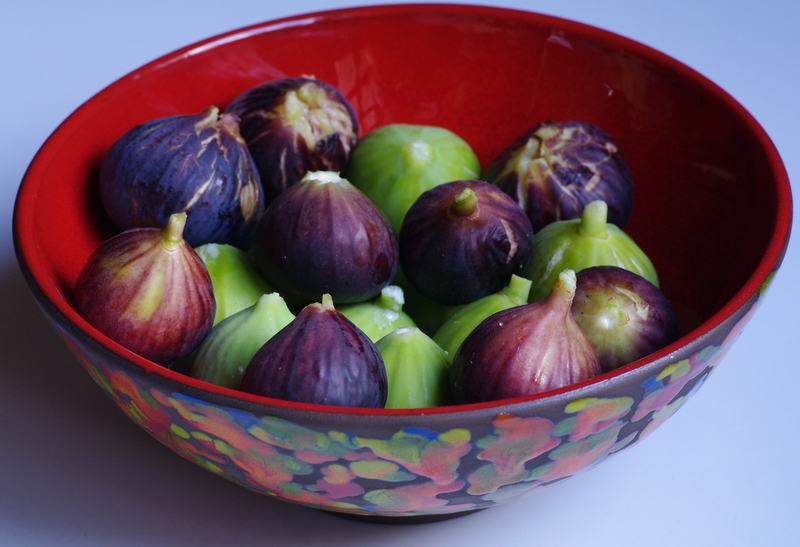 This morning we picked figs from a friend’s tree and one or two more from wild trees we passed while we were out. They’re perfect for eating as they are. A special treat at this time of year, and one which for me brings back flavours and scents from my childhood in Turkey, is being able to stuff these Kandil dolma peppers with spicy rice and cook them in tomato sauce. 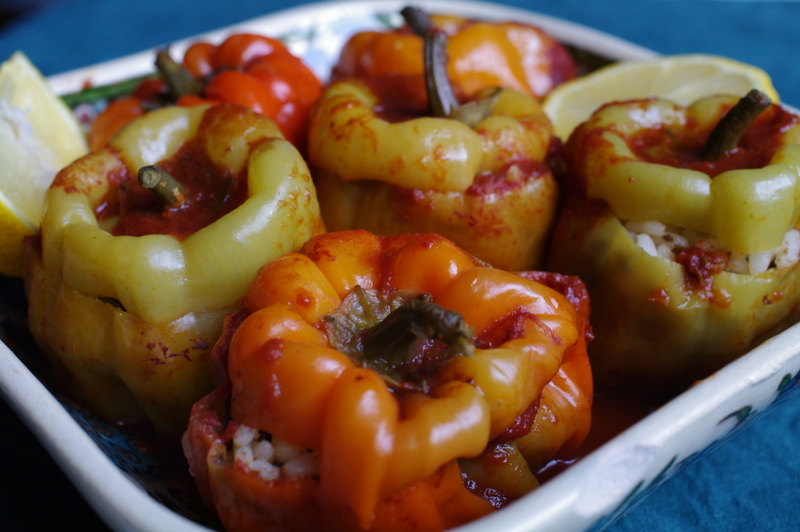 I added chopped sweet onion, sultanas, pine nuts, garlic, oregano leaves, ground cumin, cinnamon and nutmeg to some cooked rice and stuffed the peppers, put the ‘lids’ back on and arranged them in a large cast-iron pan. I poured over a jar of last year’s tomato purée mixed half and half with water, brought it all to the boil and simmered for about 40 minutes. 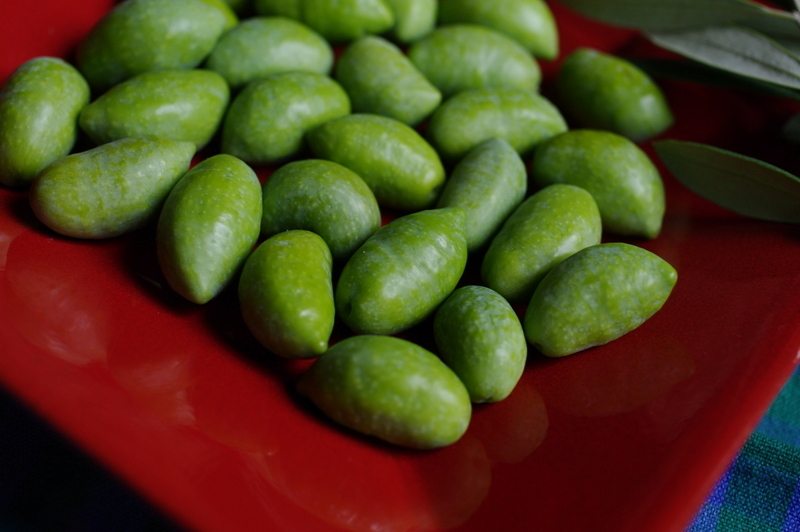 They can be eaten hot, straight away, but on a hot day like today I think it’s best to let them cool and then serve with lemon juice squeezed over them. 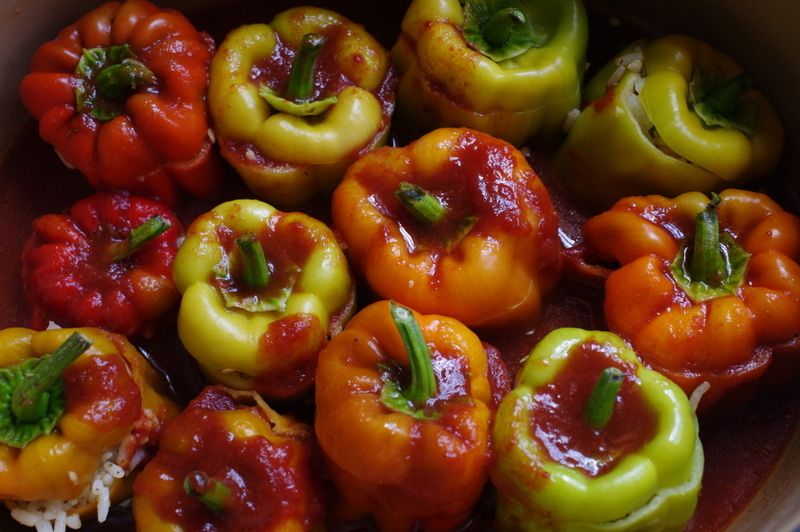 You can use any variety of peppers for this, but these Turkish ones have a special aroma that I remember from the backstreets of Istanbul where there would be huge vats of them for sale in open cafés and shops. Yesterday evening when Lo Jardinièr was lighting the barbecue for our supper in the garden I grilled some red peppers over the charcoal as it was heating up, just placing them whole on the rack and turning them with tongs over the heat until the skin was slightly blackened and the flesh was soft. 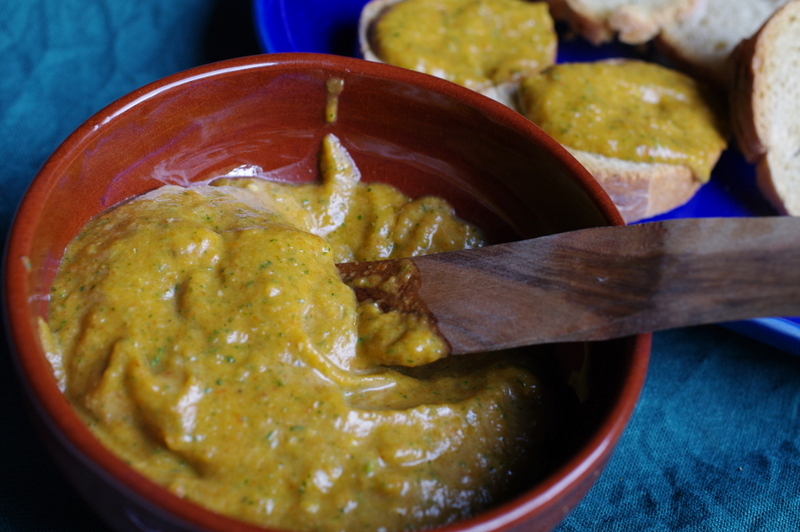 then I peeled them and saved them until today when I put them in the food processor with a clove of garlic, a handful of parsley leaves, some salt, lemon juice and olive oil to make a purée which could be eaten as a dip or spread on toasts. Another wonderful way to take advantage of the numbers of peppers we’re picking now. And those bugs . 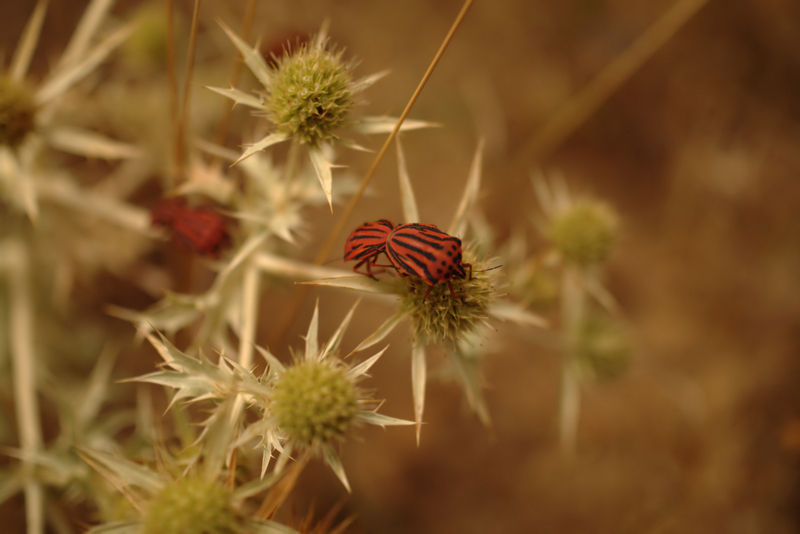 . .
Out in the garrigue near the village this morning I found several pairs of these Mediterranean striped shield beetles – Graphosoma semipunctatum – mating on a dried thistle plant, and what looks like a spider playing gooseberry! 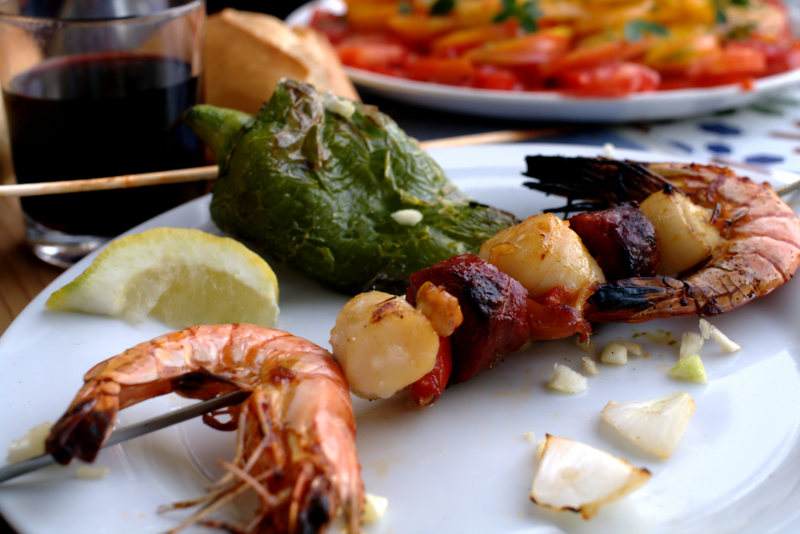 All the family arrived yesterday so we barbecued brochettes of gambas, scallops, chorizo and onions, to eat with grilled peppers straight from the plants, followed by tomato salad, also straight from the plants. Isn’t summer wonderful? 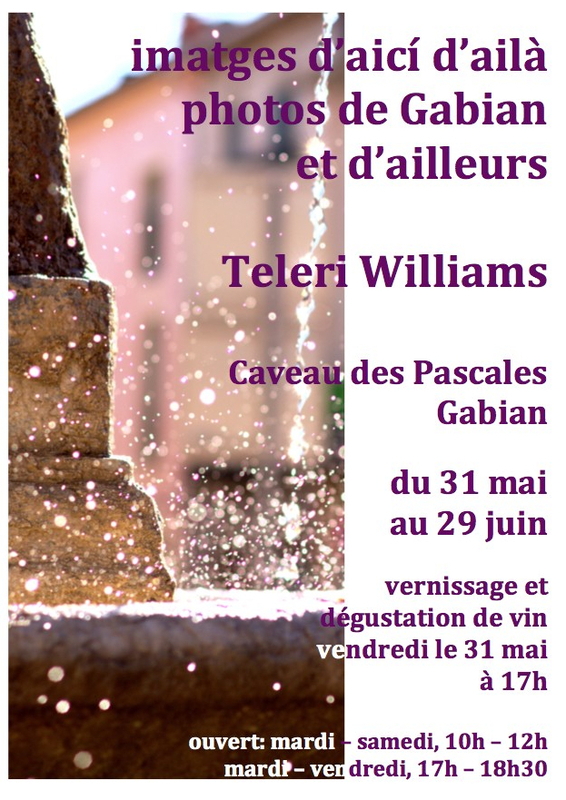 We’ve had two long and very hot days going to Lodève for the wonderful Voix de la Méditerranée festival which is on all this week, a week packed with poetry in all the languages spoken around the Mediterranean and music from all its cultures. It’s my favourite cultural event, one that I look forward to from year to year. 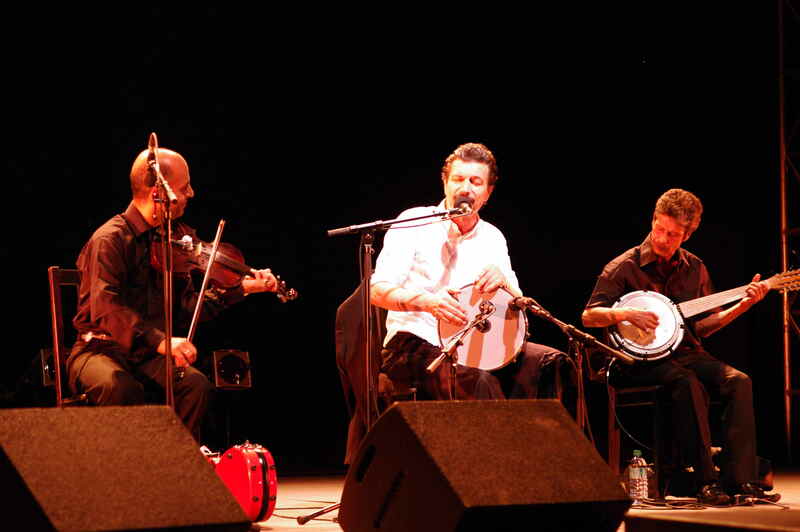 Among many other excitements, we were exhilarated by two hours of non-stop Turkish gypsy music by Burhan Öçal & l’Ensemble Oriental d’Istanbul, and cooled while we listened to poetry in the welcome shade of the Cours Casablanca. 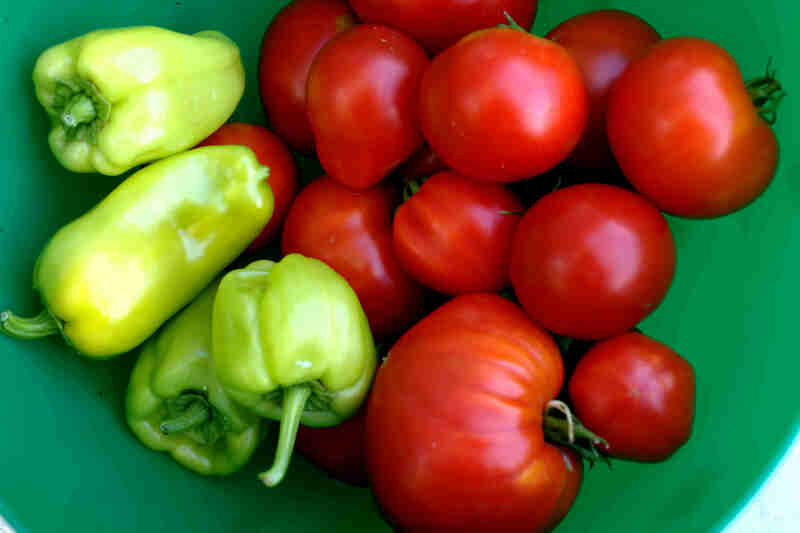 But it was hot, 38°C yesterday, and tiring so it was a pleasure this evening to sit quietly in our garden, eat our supper which included tomatoes and peppers picked straight from the plants, and water all the vegetables that are just beginning to come into full summer production.